Last week when I revealed my bro's recently updated apartment, I made a promise to share how we managed to make his armoire totally rock. We knew we wanted to find an armoire that boasted enough storage for all of this clothing, linens and other personal belongings, since his apartment didn't have any closets. My first instinct was to check out IKEA since they boast a large selection of armoires and have reasonable prices. During our trip to the store, we took our time looking at all of the potential options, and both agreed that we really liked the Hemnes PAX. 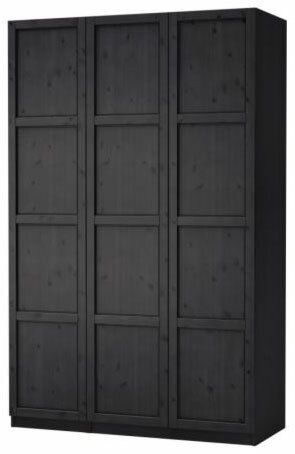 At $130, it the DOMBAS armoire came in at $300 less! YAY for us since that money was put towards bedding, a desk, shelves, accessories and lighting! Boo for the fact that it looked like a piece of standard stock garage cabinetry. Giving the armoire face lift only cost us a couple extra dollars in wood, some leftover chalkboard paint and a quick hour of our time. We ran to the home improvement store and picked up about eight 3/8"x2" boards. 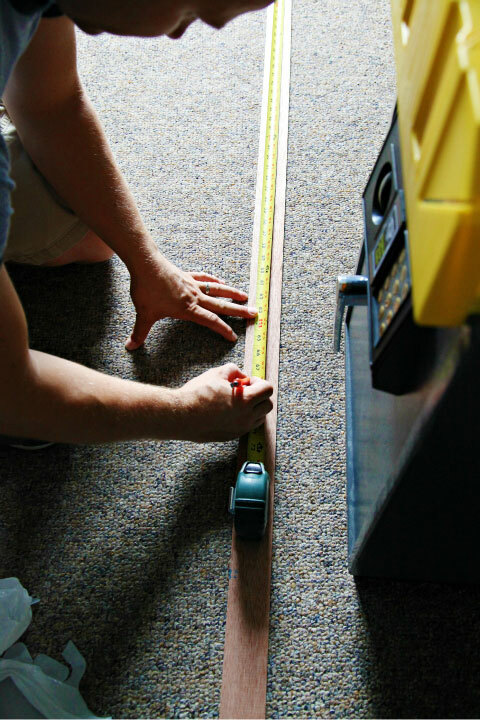 From there, it was a basic game of measure, cut, nail. 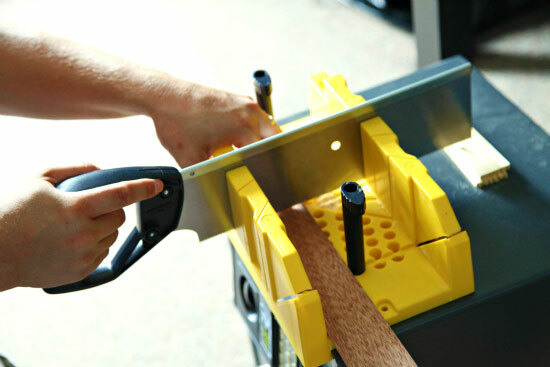 My Mr. cut the pieces of wood with a simple miter box. And used his brad nailer to attach them to the fronts of the armoire. We started by framing the faces of each armoire door first. 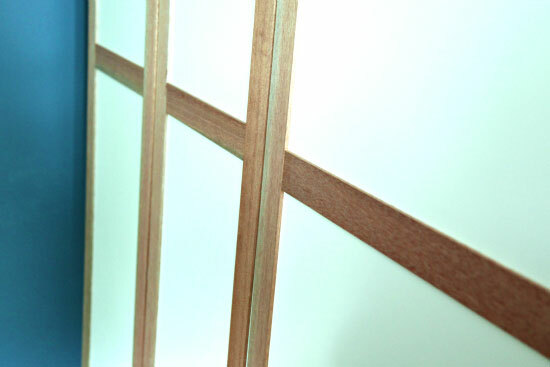 And then we used a few of the remaining wood pieces to add horizontals. And the armoire was ready for the chalkboard paint. 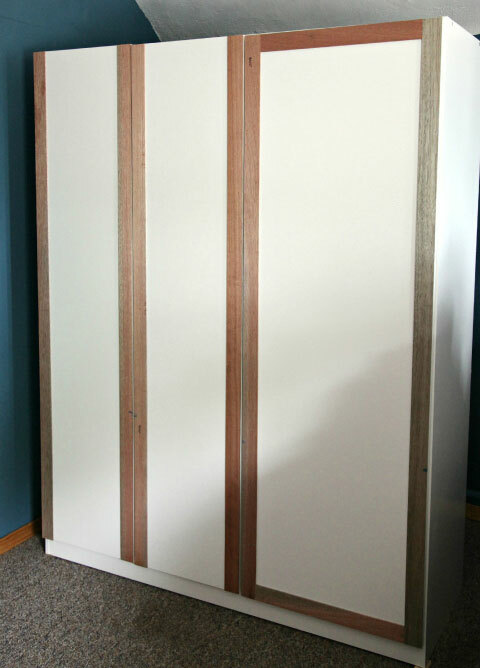 The armoire was a melamine material and had glossy edge stripping around the outer edge of each door, therefore, I knew I could only paint the fronts of the doors without too much complication. The paint covered well on the wooden strips, and did a little smudging on the melamine board since I didn't use a primer. I used a foam roller to ensure thin, smooth coats. The first coat acted as a great base, after the first coat was dry, I re-coated with another two. The process was nice and quick, chalkboard paint tends to have really great coverage. We were all really happy with how nicely and easily the armoire transformed from something so blah to something with a little more umpf with just a few basic and simple supplies. Of course, I also love that is acts as a piece of multi-functional furniture and cost a fraction of the original inspiration piece! What have you been hacking lately? Anyone else playing the high/low game? Love this!! We are in the process of purchasing a new home and I can't wait to start some new projects!! Thanks for the inspiration! 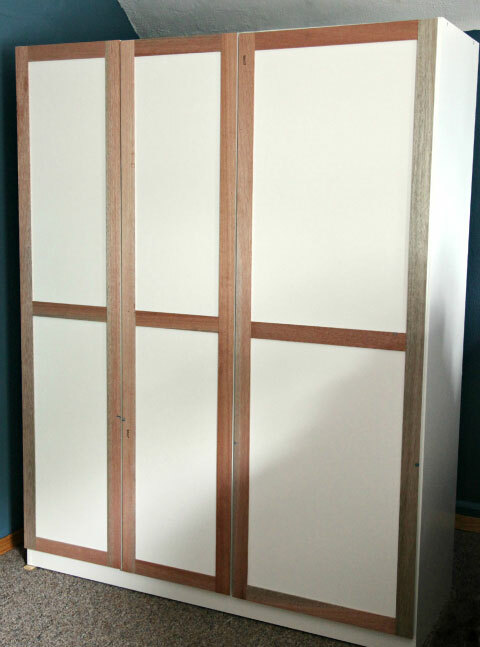 I love how you took such a basic armoire and turned it into something fantastic and functional! That turned out great! 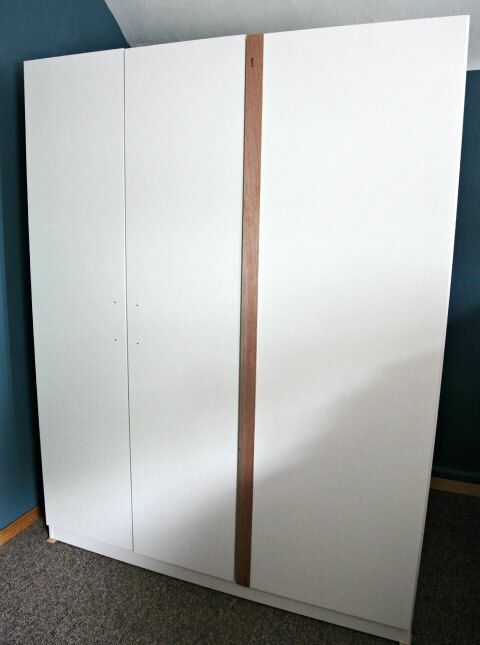 I love how Ikea furniture is cheap enough that you don't feel guilty about painting it straight home from the store. What a great hack!! What you did looks so simple to do, but has a great impact. I'm sure that big cabinet povided a lot of much needed stoage as well. This looks amazing. Don't you just love IKEA. You did a great job! IKEA has just about anything you want & something in just about any price-range you are looking for. 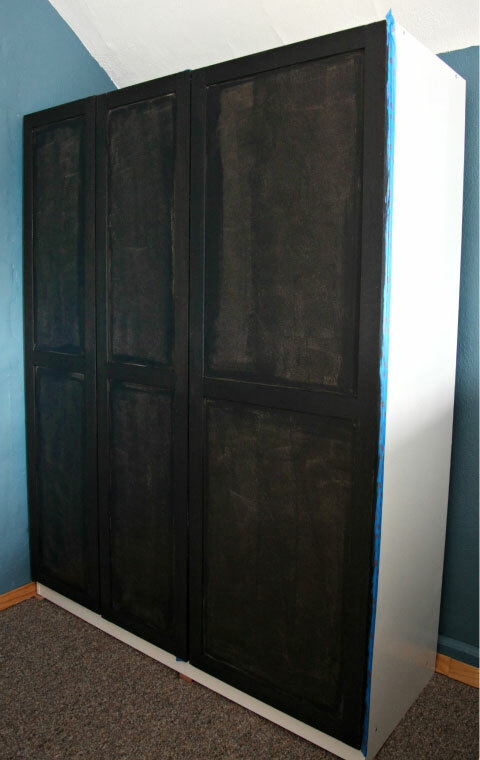 Great idea to paint the storage with chalkboard paint. I just hope you seasoned the surface before you started writing notes - that was a mistake I made once....lol! can you explain what seasoning the surface means? i've never heard of that. I think you have to rub chalk all over it (with the side of the chalk) until it is covered, and then erase the whole thing. I am pretty sure I read that somewhere once... But, I could be wrong. I was wrong a couple of times just last week. What a great idea!! !i love it! What a great idea! Love the way the apartment looks - most guys don't put a lot of effort into their places! The only problem I have with cheap IKEA furniture is that it sometimes isn't as sturdy as the more expensive things they sell. My guest bedroom closet is like that and I hate that I didn't get the more expensive one! Oh my gosh Love it!! 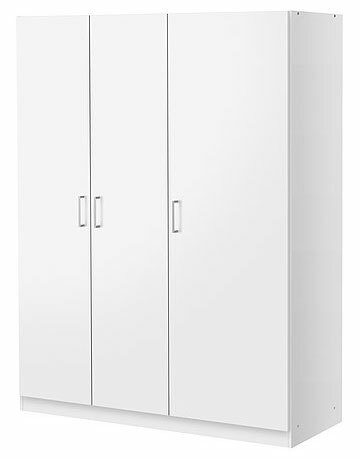 Thank you I have been looking for a closet/storage, and you are right they are so expensive!!! so thank you again for sharing this!!! Those additional boards and paint really transformed that cabinet! You're a genius, and your husband deserves a big round of applause too! Another amazing transformation! Inspiring as always. I just can't get enough of your projects!!! Does the chalkboard paint scuff? Also, what did the landlord think of the space afterwards? I would so hire you if you lived nearby! I need soooo much help with a couple of rooms! I love it! I just hacked a beat up Walmart shelf (short wood-veneer particle board :oP. You inspired me to try the different-color-on-the-inside approach, so now it's pale pale aqua on the outside and medium (electronicky) gray on the inside. It only has one shelf now and holds our small tv (previously on a cardboard box on the hearth) and sits on the hearth. TVs on the hearth are kind of tacky but our apartment is so tiny and it's never going to get used in Houston! Anyway, a steak knife cut holes in the cardboard backing - so No Cords and Better Sound (acoustics!). Thanks for all your inspiration! This looks great! I love the finished product. I have been looking for something similar for our pantry/mudroom and I think this is just the thing. I'm just curious what the inside is like? The Ikea website doesn't show the inside either. Is there anyway you could explain it and/or send me a picture of the inside?? :) Thanks so much! It's wonderful! 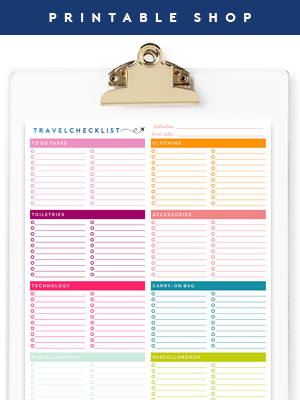 Trying to plan our third child's dorm room next year and hoping there is room for this! I would love to see the inside as well. Quick question....did you secure it to the wall and how? That could be an issue for a college dorm room as opposed to an apt. Thanks! 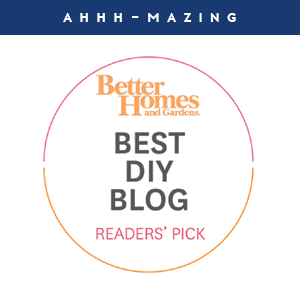 I think your blog is very inspiring, i enjoyed reading it. Lets follow each other! Wow! This looks SO good! I actually have a brown Dombas from Ikea and have been trying to figure out how to make it look less.... well, ugly! I can't wait to do this. The chalkboard paint would be super fun in a playroom too. Thanks for the great hack! You're so awesome. Come to my house? No. Really. ;) love all your ideas!!! Muah! This is seriously amazing! My little brother just went off to college and I would love to do something like this for him. I can't get over how genius chalkboard paint is! Woow!! it looks amazing. At the beginning I didn't even noticed it was customized. But it will take a lot of time to do this I guess. I'm happy with my room now. Maybe I can use this post for the future! Funny you should call it standard stock garage storage. I have that cabinet in my garage! Now I know what I'll be doing with it if it ever makes a move inside. I also have some in my garage, I think that is where the reference came into play, lol. :) xo! Such a great idea, Jen. This would be cute in so many different spaces. Lucky brother. Hope you had a blast at the game! Wow that came out fantastic! This turned out so great! 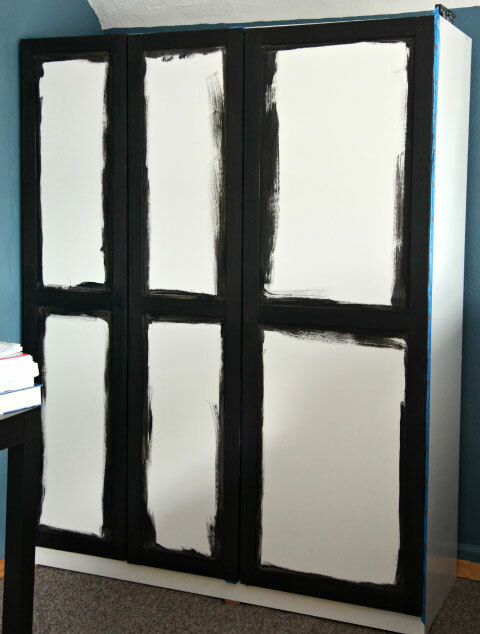 What a great idea to use chalkboard paint! Very clever! My son is going away to school next year and I'll have to keep this in mind. Love it! 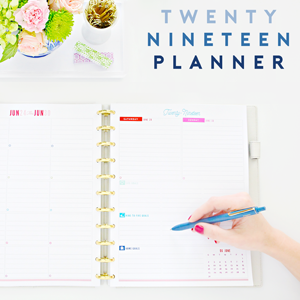 Love the overlay idea! What a way to save money, Jen. Especially like that the cabinet is also a chalkboard for class schedules, etc. oh this totally rocks! I have one of these and just yesterday I was thinking it was too stark for my bedroom, and that I wanted to add some trim to the front. Awesome job! What a great idea! Love the upgrade! That is Fabulous!!! :) Love It! One way we're trying to save a few $$ is to buy custom windows from salvage stores. These windows were ordered custom, only for the initial customer to realize that they measured incorrectly. The windows are therefore scrapped to a salvage store and sold at a fraction of the cost of standard windows. We're hoping to save big by purchasing these windows before framing! I'm wardrobe window shopping for my son's room and have considered various DIY ideas - I can't believe I didn't think of a chalkboard paint option. I've tried painting virtually everything else with that stuff! Love how your project turned out. Beautiful!! I came across your blog a few weeks ago, and it's my new favorite. You, as well as your contributors, are so inspiring. 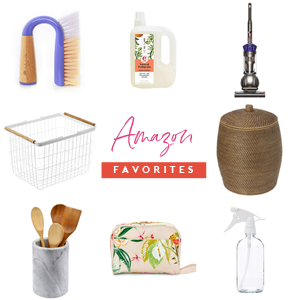 We are almost ready to move into our brand new house (with lots of storage), but your blog has helped me with ideas on decorating and of course organizing in all our new space!! Love it! There isn't anything I dislike about this. Such a simple and beautiful "face lift" Great work Jen! You are one clever gal!! 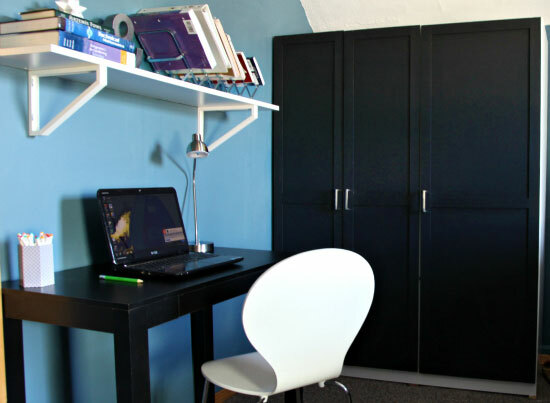 I love Ikea hacks...and this is seriously awesome! Great one.The hubby and I are constantly playing the high/low game, as we are in the process of building our own home. I got a dombas on sale a couple of years ago for 49.00. Now I'm thinking I might redo it to make it look more interesting. Hmmm. 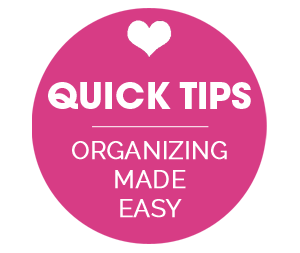 Depending on where you're going to put it and what you're going to store in it, you should make sure you get an armoire that's large enough for your needs. How oh how did you get the closet so that there is o gap between the two double doors. I have almost an inch gap and no amount of playing with the hinges has helped. Hmmm, we did nothing special, we just didn't have gaps on our particular unit. Such a bummer, not sure what you could do? 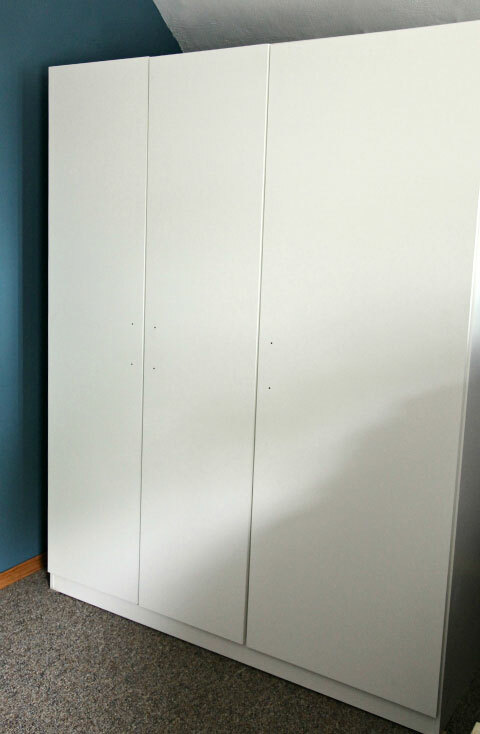 I bought this wardrobe today on a budget and wanted to paint it. But I've never done DIY like that before. I want to get it black too but not sure chalk is for me although I love the look. Is there a paint I can use to achieve this? And can I paint the sides?